This is the first game in the Marvel vs. Capcom series. For other games in the series see the Marvel vs. Capcom category. Marvel vs. Capcom (subtitled "Clash of the Super Heroes") is an arcade game developed by Capcom in 1998. While the gameplay was typical of the Marvel vs. Capcom series, it was distinguishable by two features: the ability to summon assist characters, and the Duo Team Attack. The game takes place within the Marvel comic continuity, as Professor Charles Xavier calls out for heroes to stop him before he merges with the consciousness of Magneto and becomes the being known as Onslaught, the final boss. 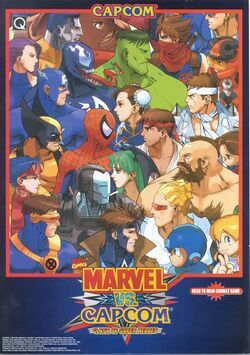 It was released for the Sega Dreamcast in 1999, and a special version of the game was released for the PlayStation in 2000 entitled Marvel vs. Capcom EX Edition in Japan. Unlike the previous game in the series, the point character of a Marvel vs. Capcom team can not summon the offscreen partner for an assist attack; instead, an assist character is randomly selected before the match began. This character can be summoned a limited number of times in battle to attack the opponent in parallel. Codes can be used to force the system to select a certain assist character. The Duo Team Attack allows a player to control both characters on his or her team simultaneously for a brief period of time; the characters have unlimited use of their super moves during this time. Since some characters have hard-to-avoid super moves that did substantial damage if blocked, the Duo Team Attack led to tactics that were oriented around activating it before your opponent could. The PlayStation version of the game differs from the arcade version, in that players are unable to switch characters on-the-fly, reducing the secondary character to an assist role only. Since only one character was selected by the player, a Duo Team Attack would call the assist character repeatedly without cost during its duration. The PlayStation version instead offers a "Cross over" mode where each player chooses one character, and the second character for each team is a mirror of the opponent's pick. In this mode, the players may switch characters at will, but the teams must always be identical. This page was last edited on 17 May 2016, at 18:31. This page has been accessed 136,838 times.